There are so many reasons to choose a conventional mortgage. There’s a common myth out there that all conventional loans require that you put 20 percent down, and while it’s true that many lenders require 20 percent down for conventional loans, it’s not true of all lenders. 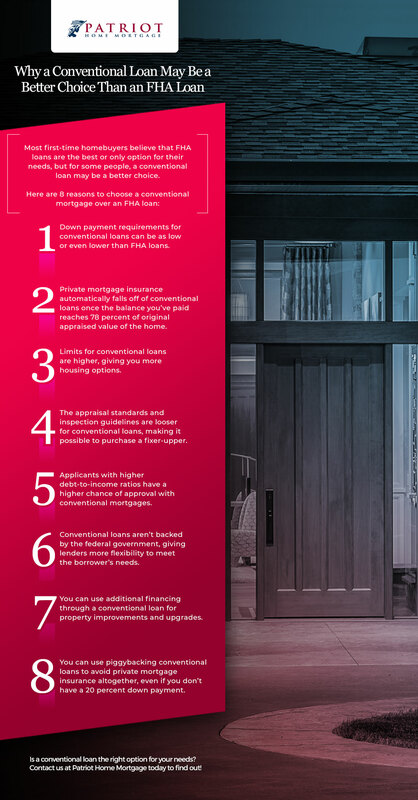 This myth is probably the biggest reason why so many first-time home buyers think that an FHA loan is the only option for them. FHA loans are popular because they only require a minimum of 3.5 percent down, but did you know that you can get a conventional loan for as little as 3 percent down as well? When you put less than 20 percent down on a mortgage of any type, you’ll have to pay PMI, although PMI is called mortgage insurance premiums (MIP) when referring to an FHA loan. With an FHA loan, the MIP consists of an upfront premium, which you can either pay at closing or roll into your mortgage, and a monthly premium, which is a part of your monthly payment. You continue paying the monthly MIP for the life of an FHA loan. The only way to get rid of the MIP is to refinance with a conventional loan with 20 percent down. With a conventional loan, on the other hand, there’s no upfront premium, only monthly premiums (the rates are based off of your credit score and the size of your down payment). The major benefit of choosing a conventional loan is that PMI will automatically end once you’ve paid the balance of the mortgage to 78 percent of the original appraised value of the home, and you can ask your lender to remove it once you’ve paid the balance to 80 percent. Once your PMI goes away with a conventional loan, it lowers your monthly payment. And of course, if you put 20 percent down on your conventional loan, you’ll never have to pay PMI in the first place! The limit on the amount of money you can borrow is calculated differently for FHA loans and conventional loans. Limits on FHA loans are calculated based on the median home price in the area you plan to buy, and they are smaller than limits on conventional loans, which are based on your credit report. The limit on FHA loans can greatly reduce the numbers of houses available to you, and in addition to limiting the price of the properties you can look at, they also limit the type of property you can look at as well. With the FHA loan program, you have to live in the house you purchase full-time, but with a conventional loan, there are more options, which means they can be used to buy vacation homes and rental properties in addition to primary residences. When you choose an FHA mortgage, you must choose a property that meets the FHA appraisal and inspection guidelines, which are very strict. These guidelines are in place in order to prevent a buyer from purchasing a substandard home that will cost an arm and a leg to maintain; however, they also prevent people from buying cheap homes that could be fixed up. 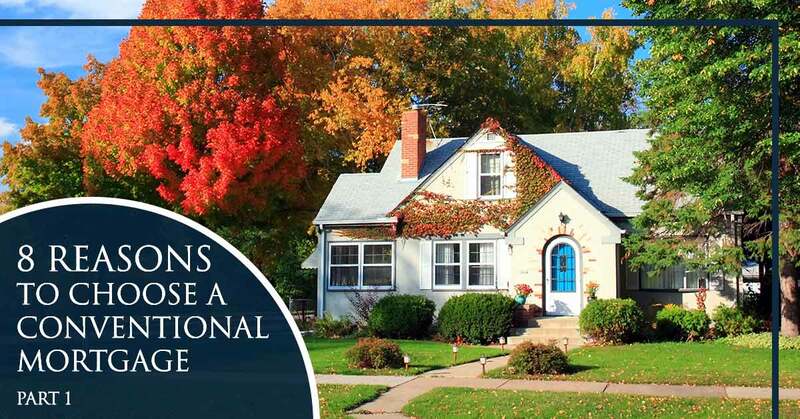 With a conventional loan, on the other hand, the appraisal and inspections standards are much, much more flexible. The home doesn’t have to meet any specific standards as far as the appraisal is concerned. However, keep in mind that the condition of the property will have an effect on how much your lender is willing to lend. Would you like to learn about four more reasons to choose a conventional mortgage? If so, stay tuned for our next blog! In the meantime, if you’re interested in a conventional mortgage, FHA mortgage or any other type of home loan, the experts at Patriot Home Mortgage are here to help. Contact us today to get started!